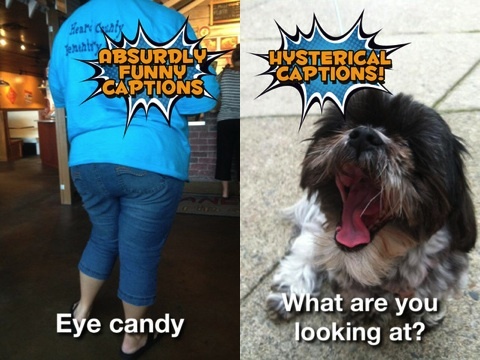 I’d Cap That app for iPhone and iPod Touch adds funny, witty captions to your photos. The I’d Cap That iOS app may be free of bells and whistles, but it is certainly filled with laughs. From the I’d Cap That photo captioning app home screen, you are presented with two choices. You can add a caption to a photo stored in your iPhone library. Or, you can shoot a photo from within the I’d Cap That iOS app. The in-app camera is a simple interface. You can add flash and turn the camera to take a photo of yourself. You snap a shot, and a random caption appears on the screen. If you choose a photo from your iPhone library, the selected photo with the random caption fills the screen. You can tweet, email, or save your I’d Cap That captioned photo with one touch gesture controls via the share icon at the bottom of the screen. The captions selected by the I’d Cap That iOS app are completely random. The randomization of the captions brings life and energy through the crazy juxtaposition of the caption and your photo. Captions like, “Probably hitting on you,” “I like a guy who can rock a tool belt,” and “Dude, that’s not where I parked my car” are just a few of the random captions provided by the I’d Cap That iPhone app. The captions can also be provocative and sexually explicit, so it’s definitely an app with mature content. The I’d Cap That iPhone app is great fun coupled with easy, no frills functionality. The I’d Cap That iPhone app’s random captioning makes an action-packed night out’s photos more exciting the next morning. AppSafari review of I’d Cap That was written by Jenni Ward on June 28th, 2012 and categorized under App Store, Free, Photos, Video. Page viewed 4141 times, 1 so far today. Need help on using these apps? Please read the Help Page.